This set is so beautiful. It adds great value to my kitchen as it compliments my other accessories. The craftsmanship is simply amazing. I absolutely love it. i love the sleekness of the mugs as well. Madison Lifestyle NY Bright Copper Mug Rack - Rose Gold Kitchen Countertop Accessory Cup Holder Hooks - 6" x 6" x 13"
"I have 2 questions. How many ounces will the mug hold? Are they microwave and dishwasher safe? 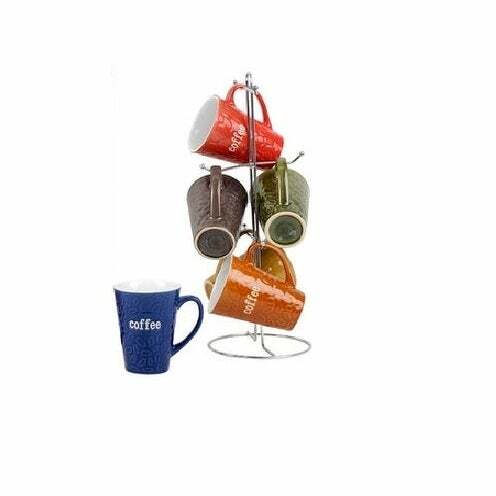 Thank you "
The mugs hold 10-12 oz, and they are dishwasher and microwave safe.